Solar power is a renewable energy source that can offer a wide range of benefits for homeowners. Until fairly recently homeowners had to choose between an appealing roof that was attractive but that did not offer the ability to capture solar energy or a roof that provided solar power using large solar panels that stood out and detracted from the home architecture and aesthetics though. That is no longer the case with the development of residential solar panel roofing though. Today it can be difficult to tell which homes utilize solar panel because new panel models are designed to flawlessly blend with the rest of the roof instead of standing out and detracting from the appearance of the home. How do Solar Panel Roofs Work? Solar panels have photovoltaic cells embedded in them. These PV cells have the ability to convert sunlight into electricity, or more specifically into direct current or DC power. An inverter is then used to convert the DC power collected into alternating current or AC electricity that can be used to power the electrical components of your home. An electrical panel controls the power that has been collected, sending electricity to appliances, lights, and other electrical components when power is needed. Batteries can be used to store any excess electricity that is not needed at the time of collection. This energy can be used at a later time or even sold back to a local utility company for credits on future energy bills so that the energy can be used on the grid for other customers. A utility meter will measure energy that is drawn by the solar panels and fed back to the grid to keep track of what you are using and supplying. Traditional solar panels can be effective but they have many drawbacks. The panels can be large and bulky, they are installed over the roof so they are highly visible, the panels may not stand up well to adverse or extreme weather conditions, and they can detract from the overall look and beauty of the home. Solar panel roofing materials eliminate many of the drawbacks that traditional solar panels have. Solar shingles with photovoltaic cells have been developed which get rid of the panels that sit on top of the roof. These specialized shingles are strategically placed on the surface of the roof to provide protection and collect solar energy when sunlight is available. Areas where PV shingles can not be placed are covered with shingles that do not contain the special PV cells, providing a roof that is attractive and that seamlessly blends both shingle types while still capturing any solar energy available. Modern residential solar panel roofs combine architecture and home design with innovative solar panel technology, providing products that look great, that blend well into the roof and complement neighboring residences, and that are highly effective. Since the PV cells are embedded in the shingles there is nothing to stick up, leaving the roof flat and attractive. Solar roofing panels will collect sunlight without making the residence stand out from the rest of the neighborhood or lowering the property value of the home. You no longer have to choose between going green and using renewable solar energy or a home that is attractive and comfortable. Solar panel roofs can be installed on any type of architecture. These roofs are becoming increasingly popular, and they can be found on residences, commercial buildings, industrial structures, and even on government buildings in some areas. Home design and architecture plans for new residences will typically consider alternative renewable energy sources as well as conventional energy sources from the very beginning of the planning stage. Many architects and home designers are integrating solar panel roofs into residential design from the start today because of the energy efficiency they provide and the beauty that they offer to any home. • A new residence does not have an existing roof that may need to be removed, and the roof deck and other roofing structures can be planned for almost any weight load or design element. • Wiring in new homes can be designed to support any necessary components for solar energy conversion and other energy factors. • Older homes may require upgrades before solar panel roofing can be installed. • Installing a solar panel roof on an existing home can significantly cut energy costs as long as the home is well insulated and other energy conservation and weatherization efforts have been made as well. • Solar panel roofing can be easily implemented in the planning stage for a new residence. Adding this element to an existing home can be more challenging but it is still possible and usually very affordable as well. Solar panel roofs have come down considerably in price since the first PV panels were introduced. Today solar energy can be both affordable and effective, providing beauty and energy efficiency to your home at the same time. 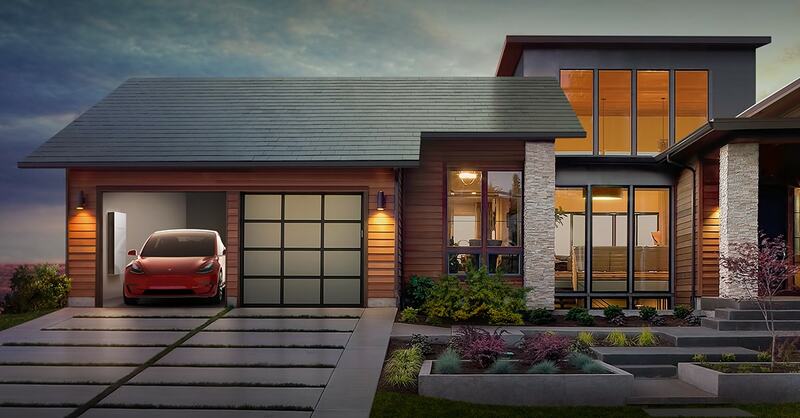 Tesla offers a solar panel roof that looks identical to the roof on neighboring residences by using specially designed glass tiles. Some of these glass tiles are embedded with advanced technology PV cells and some that do not have these specialized cells. The result is a roof that is consistent in appearance. • The cost of the solar energy technology used. A Tesla solar panel roof and a traditional roof with added solar panels may have comparable costs when the entire roof is replaced or a roof is installed on a new residence. • Is full roof replacement necessary? If a new roof is needed then replacing the existing roof with a solar panel roof should not be much more expensive. If only minor roof repairs are necessary or the roof is still in great condition then replacing the entire structure with a solar panel roof may not be cost effective at this time. • How much energy storage do you want? Some type of energy storage technology will be used to capture any excess solar energy that the PV cells collect. It is important that you have enough energy storage capacity so that no solar energy is wasted. Batteries are typically used to store any extra energy that is not being currently used. The Tesla solar panel roof offers the Powerwall, which can efficiently store extra energy until it is needed or sent to the grid. • Roof size matters. The square footage of the roof will be a factor in calculating the costs involved in installing solar panel roofing. A larger roof will require more components and roofing materials than a smaller roof, meaning more material expenses and a higher labor cost as well. Where can Solar Panel Roofs be Used? Solar panel roofs can be installed almost anywhere, but they are most cost effective and efficient in areas that receive a fair amount of sun much of the year. A location that receives more sun means more solar energy will be collected, and less energy will be needed from other sources. Even homes in colder climates can benefit from solar panel roofs, because at least some of the roof will be exposed to sunshine much of the time even when the temperatures drop. Solar panel roofs are in demand across the USA, from California to Washington to Colorado. Cities and states which see sunshine all year long started the solar energy trend but the rest of the country has caught on to the benefits of solar energy as well. In the solar panel industry there are some industry leaders who really stand out, and one of the most prominent is Tesla. The solar panels, solar panel roofing options, and Powerwall energy storage options available make the move to renewable solar energy an easy one. The Tesla solar panel roof offers flawless beauty, a streamlined look and design, and a high level of energy efficiency and conservation. Gone are the ugly solar panels of the past, the unsightly devices that perch on the roof and detract from the beauty of the home. Adding solar power to your home without drawing away from the architecture and beauty of the structure is easy and affordable today when compared to the past. The Tesla solar panel roof does not stand out in a negative way, instead it blends seamlessly so that the residence has all of the appeal that you want plus an increase in energy efficiency. Any architectural style or home design plan can benefit from a solar panel roof, as long as the right solar products are chosen from an industry leader. Tesla Solar Roof in Florida? We were lucky enough to have recently met with the Tesla team regarding solar roofing in Florida. Their current estimation is an availability date in 2019, unfortunately, our customers will have to wait until then. However, when you see the first Tesla solar panel roof, whether Orlando, Miami, Tampa, Jacksonville, Fort Lauderdale, it will be a Phil Kean home!